One of Shakespeare’s earliest comedies, the play uses the hilarious device of two sets of twins in one place but unaware of each other’s company. 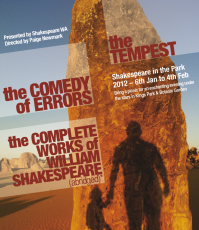 The ensuing chaos of mistaken identity, reunited families, and misguided love makes The Comedy of Errors Shakespeare’s best-loved farce. This riotous production was set locally in 1980’s Fremantle. Dressed in kilts, mohawks and doc martens, this fast paced, modern, and highly accessible version was guaranteed to delight audiences of all ages. Ron Banks in The West: There is a great deal of energy and confidence about the young players in this farcical setting, with engaging comedy performances all round . . . lovely comic turns from Montague and Walsh. Under Newmark’s tongue-in-cheek direction the cast keep the mayhem just under control to give this romp in the park the contemporary edge needed to make one of Shakespeare’s silliest and, in some ways, most clever comedies, an entertaining night out.